Right to cancel. Ability to cancel a mortgage is intended to protect consumers. Right of rescission covers refis and equity loans for some, not all, borrowers. Claim period is brief and tricky; how do the feds count three days? The law gives you the right to cancel a mortgage refinance or home equity loan. But only if you act quickly, and follow the rules to the letter. A little-known power called the "right of rescission" gives borrowers the ability, in certain circumstances, to cancel their loan deals within three days, no questions asked, and walk away. "Right of rescission" is another way of saying "right to rescind" a contract. "It's designed to ensure that the lenders provided accurate disclosures" and that consumers didn't sign up for loans that were "different than what was described to them," says Margot Saunders, counsel for the National Consumer Law Center. The right of rescission is intended to protect the consumer from putting the family home at risk by using it (or the equity) to secure a loan. It doesn't apply in cases where the mortgage is made to buy the house itself. A definition of 'Right Of Rescission' A right under federal law set forth by the Truth in Lending Act that gives a borrower the right to cancel a home equity loan or line of credit with a new lender, or to cancel a refinance transaction done with another lender other than the current mortgagee within three days of closing. Investopedia explains the right of rescission. 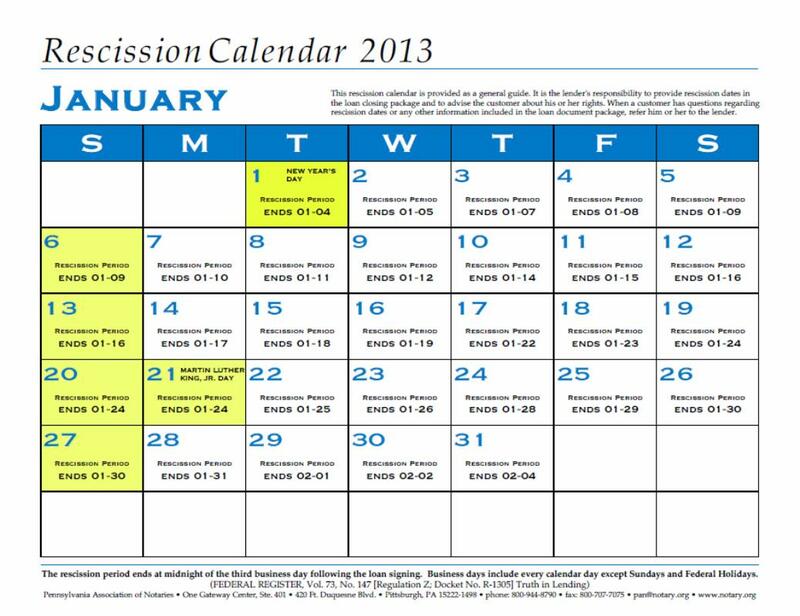 Great tool for notaries with smartphones; the iTunes link to download the 3 day Rescission Calendar for the Iphone.